In today's photo of the day, we see this beautiful beach from CNN's Manav Tanneeru. 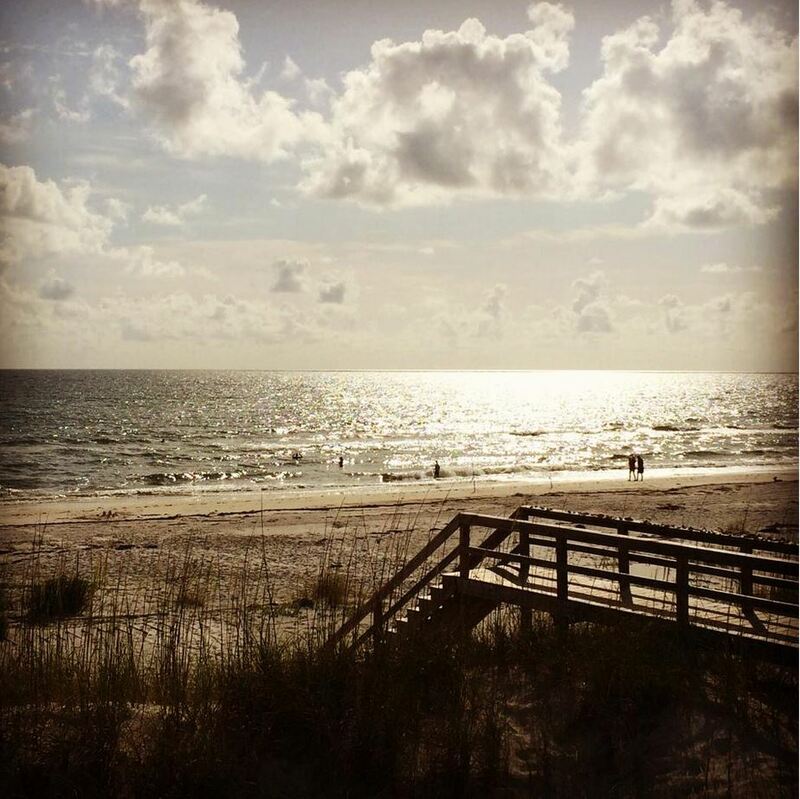 He shared the picture from Cape San Blas, Florida. If you have photos you'd like us to consider, send them our way. Post on Facebook, or tweet to us @NewDay using #NewDay. Former President Bill Clinton rated Hillary Clinton’s much-talked about "dead broke" comment from earlier this month as "factually true" on Tuesday and defended his wife as someone who isn't "out of touch." In an interview with NBC's David Gregory as part of the Clinton Global Initiative America meeting in Denver, Bill Clinton pushed back against calls that Hillary Clinton doesn't understand the average American, noting that she has worked "all her life" on "things that were good for ordinary people." "It is factually true that we were several million dollars in debt," Clinton said with a smiling Hillary and Chelsea Clinton watching on. "Everyone now assumes that what happened in the intervening years was automatic. I am shocked that it happened. I am shocked that people still want me to come give talks. I am grateful." At the start of her book tour, Hillary Clinton told ABC News that her family was "dead broke" when they left the White House in 2001. Clinton added later that her family had "no money" at that time and "struggled to piece together the resources" for mortgages and her daughter Chelsea's college education. See Political Commentator Errol Louis discuss the interview in the clip above. Drones: Do They Mean the End of Privacy? This past week, a Seattle woman claimed that a drone was spying on her in her own apartment. The owner of the drone, however, insists he wasn't spying - that he was actually using the drone to study views for a planned building. To many, drones are little more than model planes of the 21st century. But these devices also have the capacity to record video, fly longer distances and ascend higher than their predecessors. Are these drones a technological achievement or legitimate nuisances? CNN legal analyst Mel Robbins and CNN aviation analyst Jeff Wise appeared on "New Day" Wednesday to discuss the increased prevalence of drones, and how they could potentially affect privacy laws. "The capability is incredible and we haven't yet dealt with the potential for mayhem and mishap," Wise said. Drones, of late, have attracted a spate of somewhat unfavorable press - from other women alleging privacy intrusions to questions surrounding military use of unmanned planes. But is the bad rap deserved? “I think your privacy is frankly more at risk with people’s handheld devices,” she said. Privacy laws could potentially impose a drone crackdown, Robbins said, but they vary from state to state. And while technology advances at lightning speed, long-standing laws are often slow to change. If a woman is in her own apartment, Robbins said, and is visible through windows or open blinds, the legality of drone use for viewing is not black-and-white. "The fact that it's a drone is creepy as heck, but it doesn't necessarily mean it violates your privacy," she said. Do you think drones mean the end to privacy as we know it? Let us know in the comments below. Do You Need a 3-D Mammogram? Digital breast tomosynthesis, better known as 3-D mammography, can find more invasive, and in some cases more dangerous, cancers than a traditional digital mammogram, a new study published in the Journal of the American Medical Association this week concludes. But do you need one? Approved by the Food and Drug Administration in 2011 as a supplement to digital mammography, tomosynthesis creates a 3-D reconstruction of the breast tissue, giving radiologists a clearer view of overlapping slices. This new study found using the combination of digital and 3-D mammography reduces false alarms and unnecessary call backs by 15% in all groups of patients, including younger women and women with dense breast tissue. The study was funded by Hologic, the manufacturer of the 3-D imaging machine, and the National Cancer Institute. "3-D mammography finds more clinically significant breast cancers earlier... so that women have more treatment options and ultimately better health outcomes," said Dr. Emily F. Conant, senior author of the new study and chief of breast imaging in the Department of Radiology at the Perelman School of Medicine at the University of Pennsylvania. Unfortunately, 3-D mammography images cost more and are not yet available everywhere. Depending on where a woman lives and her insurance, tomosynthesis may or may not be covered.